►We welcome our customer come to our factory to make on-site inspection. 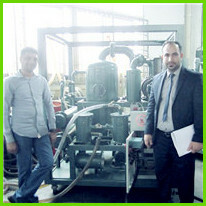 If customer wants to inspect the equipment by themself, we will arrange everything for them related to the inspection. ►We will prepare the machine well, and arrange customer’s inspection schedule well, and will guide customers for each step of the inspection, and during the inspection we will show all aspects of the equipment to customer and demonstrate the operation of the machine to show it’s actual function and components details, etc. ►After inspection, we will cooperate with customers to finish the paper works accordingly.